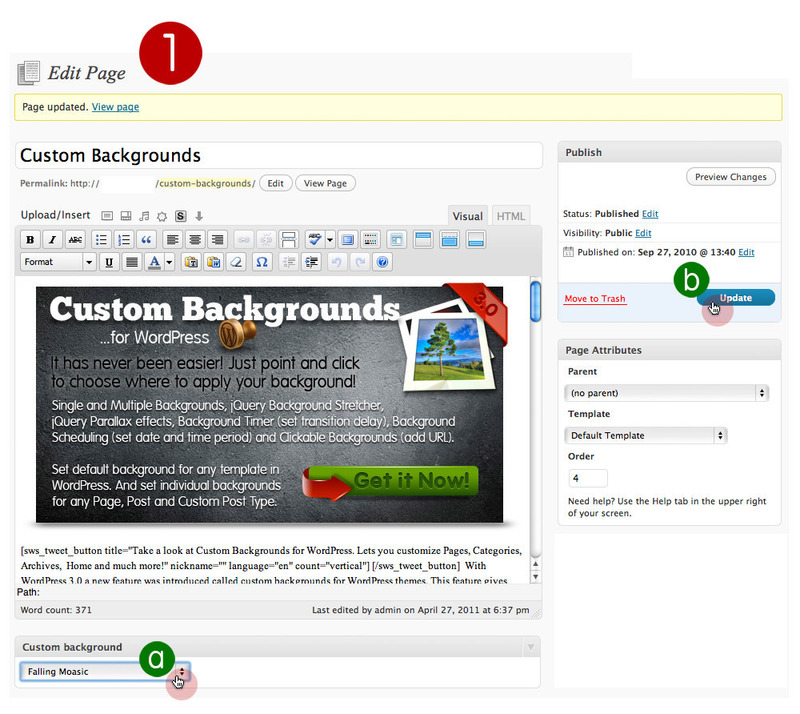 With WordPress 3.0 a new feature was introduced called custom backgrounds for WordPress themes. 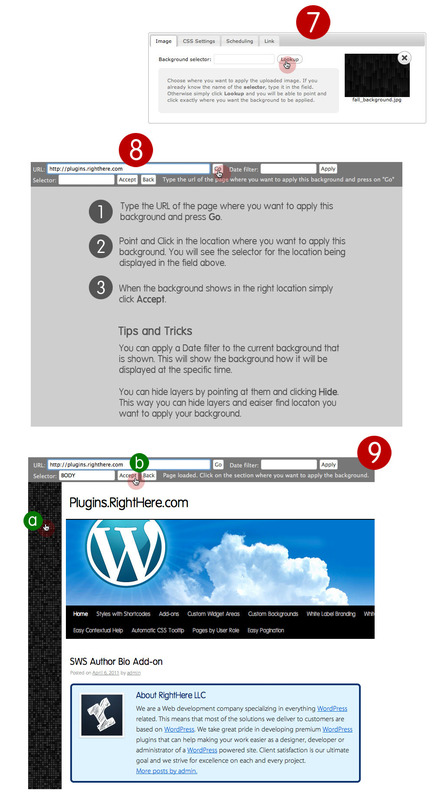 This feature gives you the ability to add custom backgrounds on your site, which will your site a unique touch. However have you ever wanted to have different backgrounds on Pages, Posts, Categories, Search page, Home page and Front page? If your answer is Yes, then this plugin is for you. This plugin lets you add custom backgrounds for Pages, Posts, Categories, Archives, Home-page, Front-page, 404-page, Search-page, Author-page, Custom Post type. Choose between 4 types of backgrounds; Single and Multiple Backgrounds, jQuery Background Stretcher, jQuery Parallax effects, Background Timer (set transition delay), Background Scheduling (set date and time period) and Clickable Backgrounds (add URL). Set default background for any template in WordPress. 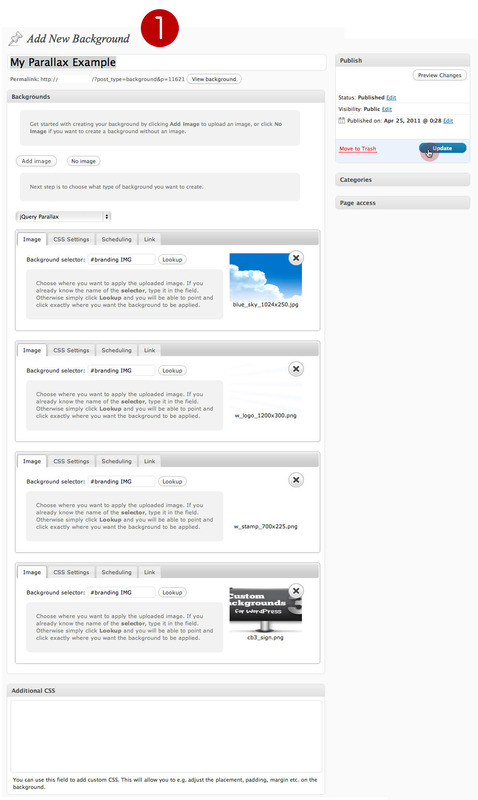 And set individual backgrounds for any Page, Post and Custom Post Type. Just point and click to choose where to apply your background. It has never been easier! Bug Fixed: On jQuery Selector Helper background is not showing when clicking in an area in preview. Improvement: Replaced add_query_arg() due to an XSS vulnerability issue that affects many WordPress plugins and themes. Please observe that before the function could be accessed the user had to be an Administrator, meaning that the potential issue was not available to the public. New Feature: When a Post or Page is assigned to multiple categories, when showing single Post or Page, the system will display the category background from which the Page or Post came from. So if you view category A and the Post is also assigned to category B and C, if you click on the Post, it will display the category A background. Bug Fixed: Suffusion theme is adding 100% width to tab elements and breaking the Custom Backgrounds admin layout. New Feature: Add overlay, custom and predefined preview (4 default overlay patterns). Option to add your own. Bug Fixed: Removed php warning when license property is not defined. Bug Fixed: Updated the developer URL in API address. New Feature: Allow setup of Custom Background for login page. New Feature: Added option to disable the cbg_tz parameter in the URL the first time a visitor opens the page (allow to disable setting the cookie for local time used by Scheduled Backgrounds). 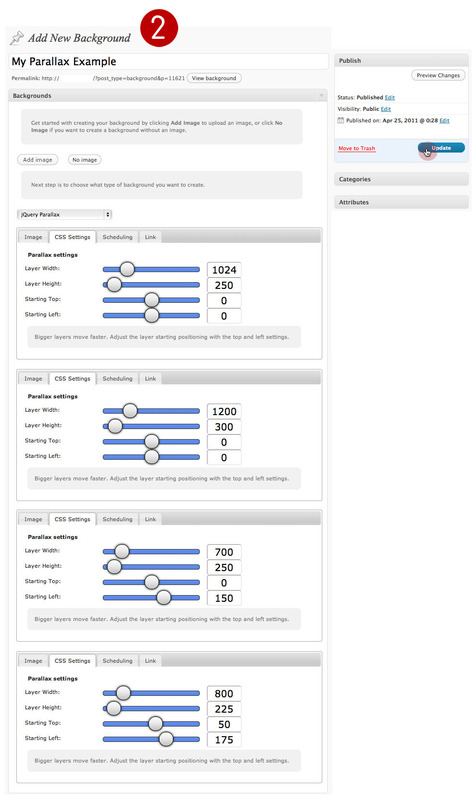 New Feature: Replaced the Options Panel with the generic RightHere Options Panel. New Feature: Moved the Background Selector on Pages and Posts editor to the right sidebar. Bug Fixed: Sliders not working when plugin is activated without any other plugin from RightHere installed. Bug Fixed: Fatal error in is_front_page() when using the Search feature.